A good overview of the underfloor heating pipes going into all the rooms. You can also see a number of pipes going up the partitions in the top middle of the photo, which to take floor sensors. Mr and Mrs Upton had chosen a hardwood floor and the floor sensors, which are connected to thermostats, will protect the wood by limiting the temperature of the floor. A note about the insulation used in this project - We do not recommend using lightweight foil backed insulation because its lightweight structure does not hold the pipe well, and it also deteriorates with foot traffic. 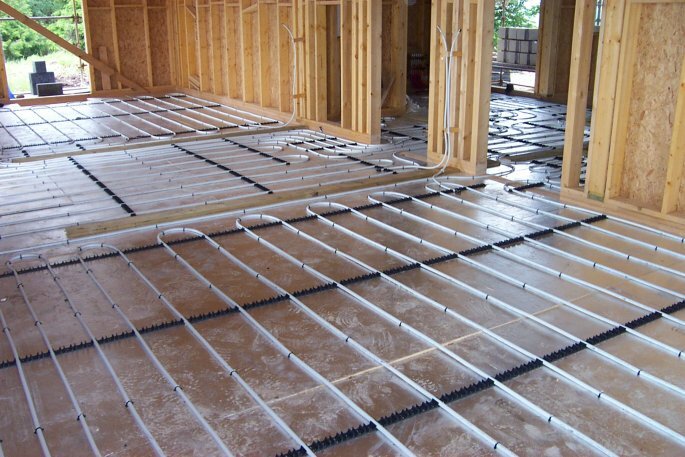 Underfloor heating supplied and installed throughout the UK by Borders Underfloor Heating. Our system carries a full ten year all risks guarantee! © Copyright 2009 Borders Underfloor Heating Ltd. All rights reserved. All rights, including copyright, in the content of these web pages are owned or controlled by Borders Underfloor Heating Ltd. Except where expressly stated otherwise, you are not permitted to copy, store, adapt or change in any way the content of these web pages for any purpose whatsoever without the prior written permission of Borders Underfloor Heating Ltd.
We will prosecute any individual or company found to be using our text or images without permission.